Certificates, Proxies and Jobs! Oh My! Oh Noes! I have a job that requires me to run an SSIS package, cmdshell script, etc. And I need them to have specific file level permissions! What do I do! I know I need to run my job/job step as a specific AD/Windows user but I don’t see how to do that. It’s not all that hard really. You just need to associate a proxy with the job step. So I need a proxy? Yes. You need to create a proxy. And you’ll need to associate it with the type of job step you’re using. Of course to create a proxy you need a credential. Ok, you’ve completely lost me. What’s a credential? And a proxy. What’s a proxy? Oh, and how do I associate a proxy with a job step??? Let’s start with a credential. A credential is a record that contains the authentication information that is required to connect to a resource outside SQL Server. Most credentials include a Windows user and password. Now that we have a credential we can create the proxy. Hey, definitions first! What’s a proxy! A SQL Server Agent proxy manages security for job steps that involve subsystems other than the Transact-SQL subsystem. Each proxy corresponds to a security credential. A proxy may have access to any number of subsystems. If it helps, subsystems include such things as CmdExec and SSIS. The different types of job steps. Now can we create the proxy? Now that we have a proxy we can assign it to the appropriate job step. Now if the person creating the job isn’t sysadmin then they will have to be granted permission to the proxy. 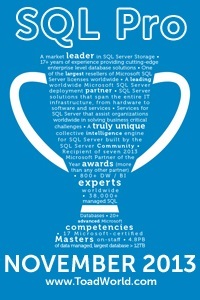 « Get your SQL Server MCSA without taking the BI exam. Should I have used TinyURLs? Not bad 🙂 I’ll have to explore a bit more later tonight.